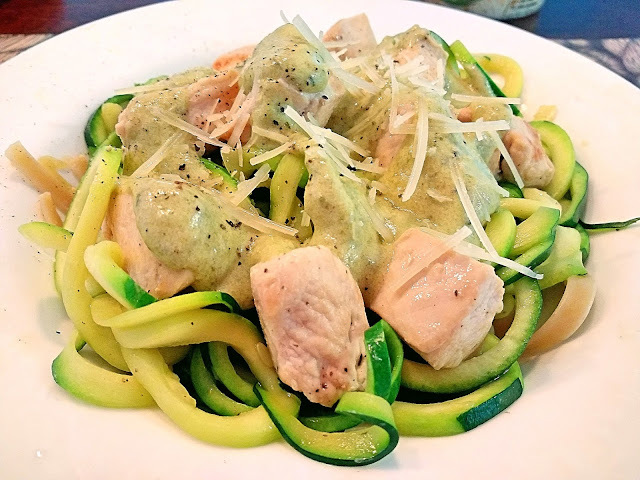 I love my spiralizer, and I love making zucchini noodles ("zoodles") to replace some pasta with veggies, but the downside of it is that the zucchini noodles don't hold their heat for very long. I also really love pesto, but it shouldn't be heated either. A few months ago, I made zoodles with pesto, and it was lukewarm at best. Anna recently introduced me to the wonders of Pesto Alfredo Sauce. Who knew you could even mix these? I didn't until now, but it tastes amazing. This way, I could heat the alfredo sauce, and then I stirred in a few tablespoons of pesto before pouring it over the dish. I also like to mix in a small serving of actual pasta, not just zoodles. Using zoodles means I can eat a giant heaping plate of "noodles." Anna sliced the zoodles for me this time, and she used the larger slider on the spiralizer, which paired really nicely with the wider fettuccine noodles. I didn't really measure anything on this, so use fettuccine, garlic, olive oil, etc. as you see fit. I also used jarred sauce, because it was a weeknight. Feel free to make homemade if you like! Cook fettuccine noodles according to directions on package and drain. Heat alfredo sauce in a saucepan over medium heat. In a large wok, add olive oil and garlic and set to medium heat. Add sliced chicken pieces, season with salt and pepper, and mix occasionally until chicken is fully cooked. Remove chicken from pan and set aside. Add more olive oil and garlic to the wok, and turn heat up to high. Add spiralized zucchini to wok, tossing continuously. Season with salt and pepper. When alfredo is hot, remove from heat and stir in a few tablespoons of pesto sauce, to taste. When zucchini is cooked, but still slightly firm, remove it from heat. Place fettuccine and zoodles in a a serving bowl and add chicken. Top with pesto alfredo mixture, and add parmesan cheese, to taste.